We are Annemie and Willy. It has always been our dream to start over again in our lives. We had some experience with Andalusia : we spent our honeymoon in Torremolinos, at that time synonym for the Costa del Sol. Later we have explored the inland… this region really offers everything: sun, sea, mountains, culture, gastronomy, warmth, light, kind and open people… ! 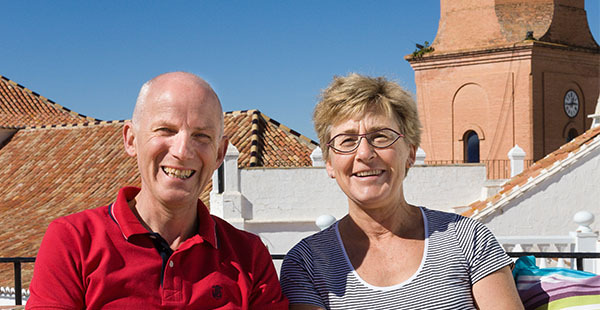 We bought our villa when Annemie became 50 and this provided a base from where to explore the Axarquia region close to Malaga. We rent out La Cordillera and our guests enjoy to the full their holiday at the Costa del Sol. Our search for a place to settle brought us to an old mansion close to the church bell tower (Campanario), in the center of a typical white washed village (pueblo blanco) of Cómpeta. The house was renovated with respect for its history. Thick walls , roof terraces, high ceilings and the typical Sevillian tiles give our dream the appearance we want to share with our guests. “Nothing is obligatory and everything is possible”.